World champion Stuart Bingham set up a China Open quarter-final tie with fellow Englishman Ricky Walden after easing past Rod Lawler on Thursday. 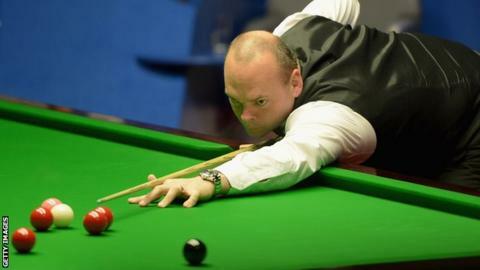 Bingham won 5-2 in the third round in Beijing, while Walden edged China's Tian Pengfei by a single frame. Scotland's John Higgins saw off David Gilbert 5-3 and will meet Noppon Saengkham, who knocked out Graeme Dott 5-1, on Friday. England's Judd Trump and Mark King also go head-to-head in the last eight. Trump was a 5-1 winner against Marco Fu, with King completing the only whitewash of the round in his success over Martin O'Donnell. Stephen Maguire and Alfie Burden complete the quarter-final draw, winning 5-1 against Dominic Dale and Rory McLeod respectively.